The Big Agnes Copper Spur HV UL 1-Man Tent is the smallest, lightest and highest-quality tent I have ever owned. Watch my video review of this incredible backpacking, bikepacking and bicycle touring tent and then click here to buy a Big Agnes Copper Spur HV UL 1-Man tent for yourself. If you’re looking for a compact tent that doesn’t take up a lot of room inside your backpack, bicycle panniers, trailer or bikepacking bags… and you want a lightweight tent that doesn’t weigh you down; a tent that is comfortable, waterproof, and big enough to sleep in and store all you gear; and you want a tent that is super high-quality and will last for several years… then the Big Agnes Copper Spur HV UL 1-Man Tent is the tent that you’ve been looking for! 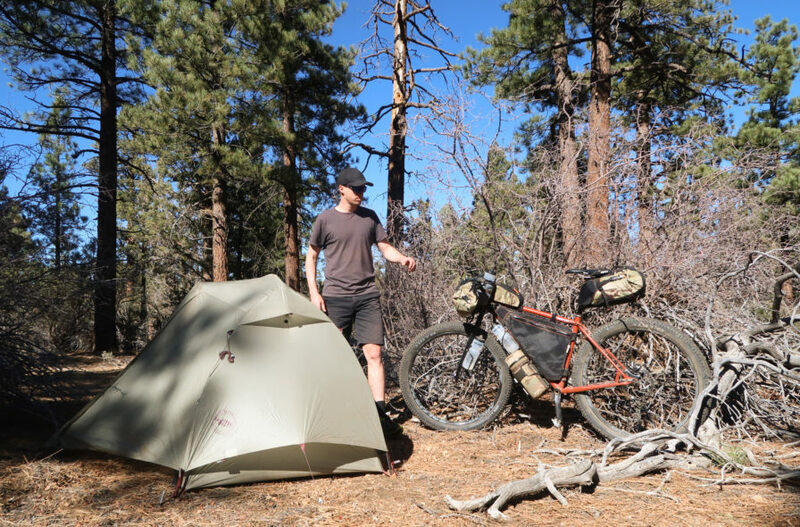 I’ve been using a Big Agnes Copper Spur tent on my bicycle touring and backpacking adventures all around the world for the last three years… and I’ve spent more than 300 nights sleeping in this tent. That means, I have a lot of experience with the Copper Spur tent… and I’ve used it in a number of different camping and weather conditions: heat, snow, wind, rain, etc. Before I purchased the new stealth green HV model of the Copper Spur tent you see in my video review, I was using the old Big Agnes Copper Spur UL 1-Man tent for about two years. 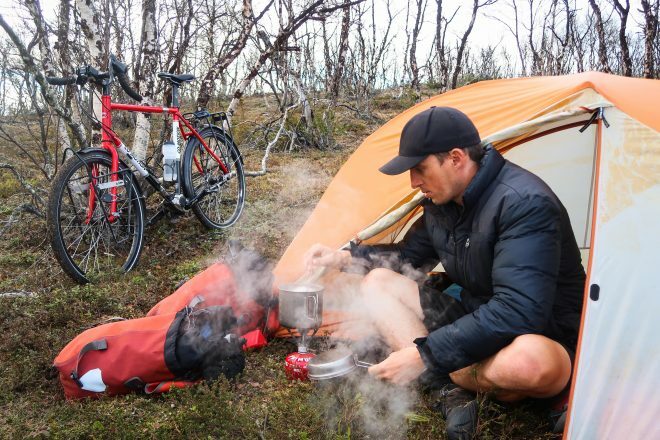 Click here to view my photos of the Big Agnes Copper Spur UL 1-Man Tent on my recent bike tour across northern Sweden, Finland and Norway. There are some minor differences between these two iterations of the Copper Spur tent (i.e. the head of the tent is larger/wider in the HV model, the foot of the tent is smaller/thinner, the vestibule is a little bit larger, the HV model is several ounces lighter than the UL tent, and the main zipper that allows you to get in and out of the tent has changed in design rather significantly). However, the two Big Agnes Copper Spur tents are incredibly similar. Either of these two tents would be a good choice, but this new HV UL model of the Copper Spur tent is a marked improvement over its predecessor. What makes the Big Agnes Copper Spur HV UL 1-Man Tent so ideal for backpacking, bikepacking and bicycle touring is the fact that it is both incredibly compact and super lightweight. This is one of the few tents that is actually small enough to fit inside your backpack, bicycle panniers, trailer or bikepacking bags… and it’s one of the few ultralight tents that actually weighs less than 3 lbs (1.36078 kg). While the Big Agnes Copper Spur HV UL 1-Man Tent is in fact one of the smallest and lightest tents currently available anywhere in the world, it’s not a cramped or crowded tent once you have it set up and assembled. Once you pitch the tent, you’ll be quite surprised at just how spacious it is on the inside. I’m more than 6 feet 1 inches (185.5 cm) tall and I can lay down inside the Copper Spur and feel quite comfortable – there are several inches/cm to spare before my head or feet hit the wall of the tent. And because the tent is 38 inches (96.5 cm) tall, I can sit up inside the Copper Spur as well and still have plenty of room before my head hits the roof. Many people assume that a 1-man tent is going to be too small for them to comfortably speed inside… but that’s not the case with the Big Agnes Copper Spur HV UL 1-Man Tent. This is a very spacious tent with a 20 square foot floor space and a 9 square foot vestibule on the outside of the tent where you can store your gear, food, shoes, and/or any other items you might be carrying with you. While the Big Agnes Copper Spur tent may be small and lightweight, it’s big enough inside to make you feel completely at home once you get out there on the road! As I said previously, I have spent nearly a full year of my life sleeping inside this tent and I’ve never once thought that the tent was too small for me. It is a compact, lightweight tent, but it feels a whole lot bigger on the inside than you might expect. Easy To Setup: The Copper Spur tent is fast and easy to set up. After picking out a camping spot for the night, just roll the tent out on the ground. Snap the poles together and insert the poles into each of the four corners in the tent. Then pull the material in the center of the tent upward toward the poles and secure in place using the hook-and-pull tabs. Then position the rain fly over the top of the tent and snap it into place by securing the buckles at the four corners of the tent. Finally, secure the tent in position with the included tent stakes. The entire setup process takes less than 3 minutes with a little practice. Well-Ventilated: The Big Agnes Copper Spur HV UL 1-Man tent is incredibly well ventilated. The mesh material on the inside of the tent keeps air flowing inside so condensation is never an issue, the bugs are kept at bay, and with the rain-fly in use you can remain warm even in cool or windy camping conditions. 3-Season Tent: While you won’t want to use this tent in extremely cold, winter weather conditions, the Big Agnes Copper Spur HV UL 1-Man Tent is a perfect 3-season tent designed for spring, summer and autumn camping. I’ve used my Copper Spur tent in the rain and snow… and it’s performed wonderfully in every single instance. Even in the cold and snow I’ve kept both warm and dry inside my Copper Spur tent. 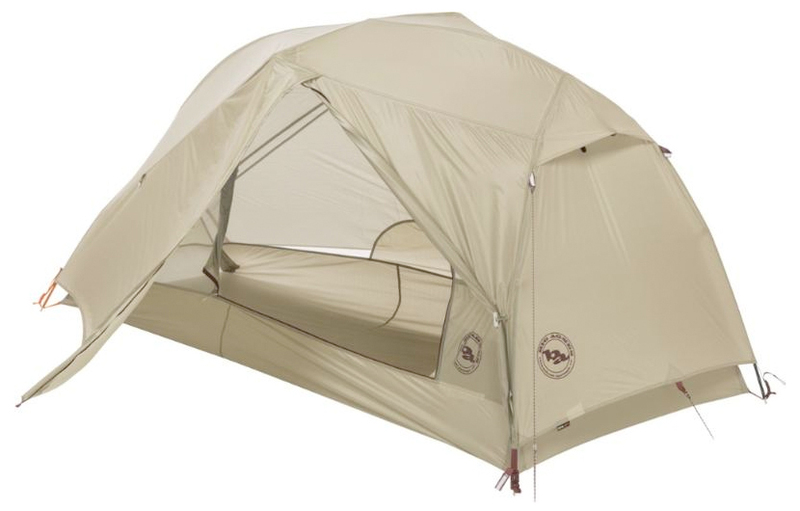 Freestanding Tent: Tent stakes are not required with the Big Agnes Copper Spur HV UL tent. You can set this high-quality tent up with or without the included tent stakes. This makes it possible for you to pitch your tent on surfaces such as wood or concrete, without having to secure the tent to the ground with the included tent stakes. This freestanding feature enables you to pitch your tent in a number of different locations and positions. Important note: tent stakes my be required in windy conditions. Rigid/Lightweight Poles: The Big Agnes Copper Spur HV UL comes with a single lightweight DAC Featherlite NFL and NSL tent pole that folds down to a compact size when not in use. While you will need to be somewhat careful with this pole to ensure that it does not break or bend, it’s a fairly robust pole design that, with care, should withstand several years of use. Waterproof Nylon Material: Any good tent needs to be waterproof and the Big Agnes Copper Spur HV UL tent is exactly that! The tent’s material is a waterproof, rip-stop nylon, which is both durable and coated with a powerful waterproof polyurethane. You won’t have water dripping in on you as you sleep in this tent! All of the tent’s seams are taped with waterproof, solvent-free polyurethane tape (No PVC or VOCs in the material). Rain-fly Not Required: If you’re camping in warm/hot weather, it’s not necessary to pitch the Big Agnes Copper Spur with its rain-fly on. Sometimes it’s nice to camp with the rain-fly off, which allows air to blow directly into the tent as you sleep. The tent’s interior is approximately 70% mosquito netting, allowing for a wonderful airflow inside the tent when the rain-fly is not being used. Large Vestibule: The HV model of the Big Agnes Copper Spur is equipped with an even larger vestibule than its predecessor. The new Big Agnes Copper Spur HV UL 1-Man Tent has a large, 9 square foot vestibule in the front of the tent where you can store your gear, keep your shoes dry while you sleep, and prepare your foot in a rainstorm. There’s even a small vestibule in the back of the tent which is perfect for storing any long, skinny gear you might be carrying with you. I, for example, stash my bike helmet and tripod under this small vestibule in the rear of the tent. Easy Side Entry: Getting in and out of the Big Agnes Copper Spur is a total breeze. The large side-entry door makes it super simple to get in and out of the tent – unlike other tents which require you to crawl in and out from the head of the tent. Getting in and out from the large side door allows you to comfortably swing your feet in and out of the tent as needed. Dual Zipper Door: One of the biggest changes to the Copper Spur HV from its previous UL model is the fact that Big Agnes has removed the large single-zipper design they had on their previous model of the tent and replaced it with a smaller 2-zipper design. One zipper runs along the bottom portion of the tent (near the floor), while the other zipper runs vertically from the floor of the tent to the roof. This small change in zipper design should improve the lifespan of the Copper Spur’s zipper. And even though the new HV door is a little bit smaller than it was in its previous iteration, there’s still plenty of room to comfortably slide in and out of the tent. Multiple Interior Pockets: Inside the Copper Spur there are several large pockets on the roof of the tent where you can store gear, food, clothing, your smartphone, or any other small items you might be carrying with you. I personally use these mesh pockets to store my trash, smartphone, headphones and gloves/beanie. There’s also another large mesh pocket on the side of the tent near the head of the door, which is perfect for stashing items you might want to quickly and easily access in the middle of the night. Gear Loft Loops: On the roof the tent tent are a series of small gear loft loops, which allow you to hang a flashlight, lantern, clothesline, or anything you can imagine from the top of your tent. I use these small loops for hanging my flashlight at night and occasionally string up my wet clothes from a clothesline I’ve mounted through the gear loft loops on the roof of my tent. 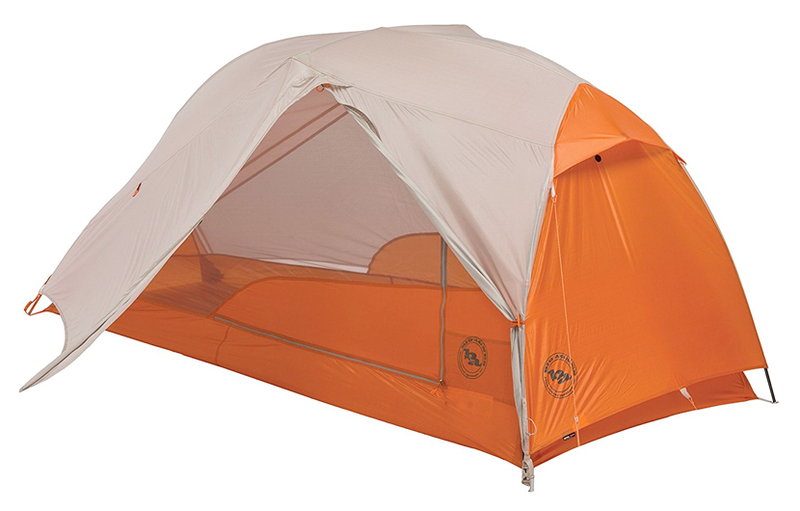 Two Color Options: The Big Agnes Copper Spur HV UL 1-Man Tent is available in two different colors: orange and green. If you want to stand out (for photographic purposes or in the event of an emergency when you need to signal for help), grab yourself the orange and white version of the Copper Spur. And if you want to blend in to your surroundings (like you might if you were to planning to do some stealth camping), then grab yourself the green model of the tent. Optional Footprint: Finally, don’t forget to pack a groundcloth for your new Big Agnes tent. The company sells an additional footprint that can be used to protect the floor of the tent for $60 USD, but any old tarp or plastic sheeting can be used. I went to Home Depot, purchased a $6 roll of lightweight painters plastic and cut that out into the shape of the floor of my tent. This lightweight, waterproof material is an excellent substitute for the pricey groundsheet that Big Agnes sells separately. If there is any one drawback to the Big Agnes Copper Spur HV UL 1-Man Tent, it’s surely its price tag. The 1-Man version of the HV tent costs $379 USD; the 2-man version is $449 USD; the 3-man version is $499 USD; and the 4-man version of the Copper Spur HV tent is $649 USD. This is not a cheap tent! That being said, every good outdoors-man knows that when it comes to high-quality camping gear (gear that is both compact and lightweight), you get what you pay for! The smaller and lighter your tent is, the more expensive it’s going to be. And that’s why the Big Agnes Copper Spur HV UL tent is priced the way it is. It’s one of the smallest and lightest tents currently available… and it’s a very high-quality tent that will serve you well for several years to come if you are careful and take good care of it. The Best Ultralight Tent on the Market! I’m not just saying this: the Big Agnes Copper Spur HV UL 1-Man Tent is the best, most lightweight and most compact tent I have ever used in 18+ years of bicycle touring, backpacking and adventuring all around the world… and if you have the money to buy it, I highly recommend this incredible, high-quality tent for your own outdoor activities. The Big Agnes Copper Spur HV UL 1-Man tent is now available now at Amazon.com and REI.com. This entry was posted in Bicycle Touring Pro Articles, Featured Articles, Main Articles, Main Featured Articles, Product & Service Reviews, Tents, Uncategorized, Videos and tagged 1-man tent, best bicycle touring tent, best bikepacking tent, best tent, bicycle touring tent, big agnes, big agnes copper spur, big agnes copper spur hv, big agnes copper spur hv ul, big agnes copper spur tent review, big agnes tent, bikepacking tent, copper spur, copper spur tent, hv ul tent, one man tent, product review, review, tent, Tents, ul tent, ultralight, ultralight tent. Nice and useful review. I need to retire my rei halfdome 2 tent this year. I have had all my gear inside the tent previous. Will need to get used to gear outside under the flap with the mosquitoes. Well for $380 you can get three nights in a budget hotel room. Or you can several hundred nights in your Bug Agnes tent! Good review! In the market for something smaller. I have a couple of great REI tents. They are just a little big. “Big Agnes” tent. Sorry for the typo!! I have been looking at the Cooper Spur HV 2 recently. I am not probably NEEDING a 2 person tent (for solo travel), but it seems like you would have plenty of luxury for only 9 more ounces (2 lb, 8 ounces for the HV1 vs 3 lb, 1 ounce for the HV2). Have you ever considered going with 9 oz penalty for the spaciousness of a 2 man tent? Actually, have you seen the new Big Agnes Tiger Wall tent? Weight is identical to the Cooper Spur HV1 at 2 lbs, 8 oz, but you get 28 sq/ft vs 20. You also get TWO vestibules at 8 sq/ft each vs the one vestibule of the CS HV1 at 9 sq/ft. I’ve personally considered carrying a larger, heavier tent just for the space inside the tent, but I’ve found that I don’t need any extra room in the tent and would much rather have a smaller, lighter tent to carry. 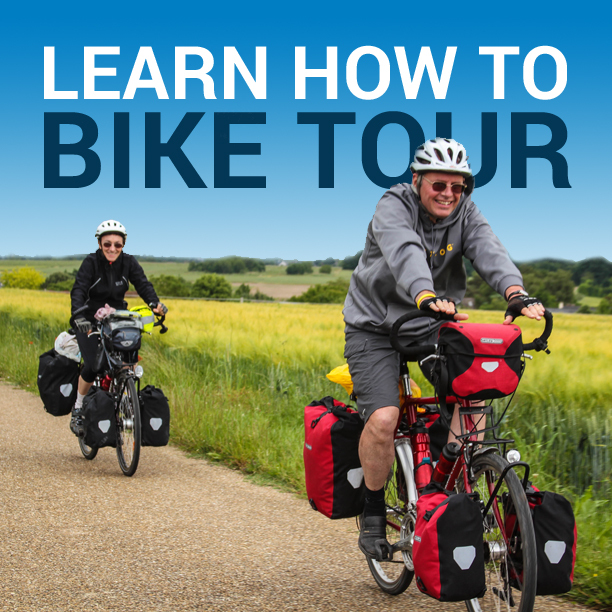 Darren, I want to thank you for this great review and all the work you do for the bicycle touring community. Your videos are an inspiration and your reviews are spot on! I have purchased this tent on your recommendation for my upcoming 30 day bike tour through Spain in September. Thanks again! You’re a pip!